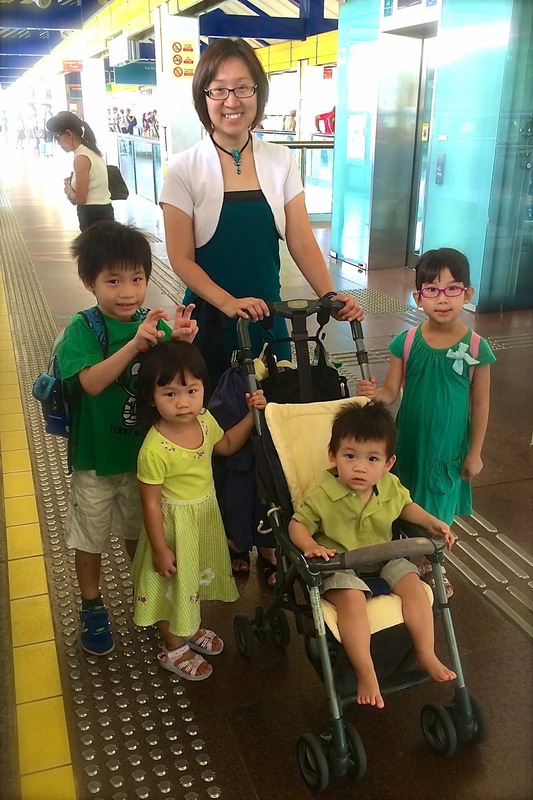 Without the luxury of a car, our family is very well-versed in going all over Singapore via the public transport. We also avoid taking the cab unless we are running late (which does not happen often because I buffer a lot of time for unforeseen circumstances) or that the destination is inaccessible by train or bus. However, when I am going around during the weekdays alone with the kids, I avoid pushing the children's limit by selecting places nearer home. Yesterday, I decided to test out taking a 1 hour train ride to visit a friend. This was the first time I went on such a long journey without my husband around to help in case of fussy kids. To my surprise, they behaved extremely well after all that training with shorter trips. They either played games with one another or simply enjoyed the scenery. At one point, all of them even dozed off together! Of course it helped that we had seats on the way there. But they merely complained a little about being tired from standing too long when we hit peak hour traffic coming home. All in all, it was a good experience. Thank God for such great travellers!!! The usual formation is rather wide so when the path is narrow, I will say "quack quack" and the children will follow behind me in a single file with the oldest being the rear guard. Just like goslings waddling behind the mother goose, hence the code words. LOL When the coast is clear, I will pause in my walking and wait for them to fall back into the original fleet formation. There will come a day when all these will become unnecessary because Joram will one day outgrow the stroller and the younger two will eventually not need to hold my hands to cross roads safely. In the meantime, I shall enjoy traveling all over the country with my darling children sticking close to me.